There are many kinds of screw options for you choosing , 20 / 410 , 24 / 410 , 28 /410 , each specification has different option , such as smooth , ribbed , aluminium , UV , hydrographics transfer printing etc . The color is mainly according to your demand. Black, white and transparent (nature) are normal whatever the number you need. Then for the other color, give us the Panton color or your sample,we will match it and the MOQ is 20000. We have many customers , and most of them are in different areas . 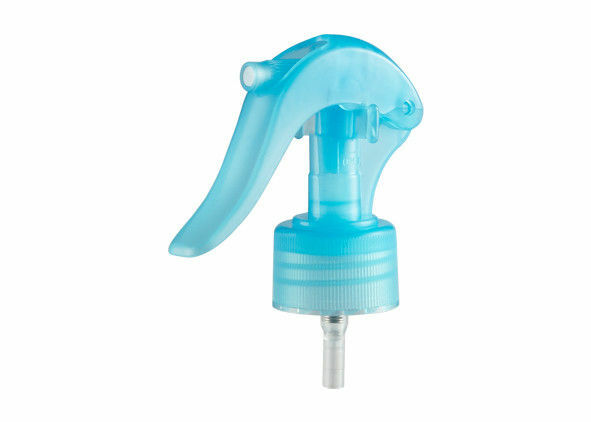 These products are usually used in the cosmetic skin care, gardening , car washing , air freshener sprayer , glass cleaning , hair care , pet care and so on . Any use you need to get to a spray effect . Usually we will use one big plastic bag in the paper carton to protect the products . 1000 pcs in one carton , different products use different paper cartons . We often use two kinds of paper carton : 56 * 38 *42 (cm) and 57 * 39 * 45 (cm) , but this is mainly according to you want which product .